Pat’s early career started with Voluntary Service Overseas in Guyana, South America. On her return she taught for a while in Edinburgh before working as International Student Officer for Scotland and North East England for the National Union of Students which led to her appointment by the University of Dundee to set up and run its first Student Counselling and Advisory Service. From there it was back to Edinburgh to work in a number of posts for Lothian Region and Edinburgh City Councils – including Social Work Education Officer, Publicity Officer and Business and Communications Manager. After working as Head of Communications and Directorate Support at Essex Social Services and Corporate Strategy and Communication Manager at Chelmsford Council, Pat became an independent consultant in 2006 and her clients have included Essex, Hertfordshire and Norfolk County Councils, Southend Borough Council, City of London Authority and most recently the Ukrainian government. Pat has a CIPR teaching certificate and has taught on the CIPR Diploma and Crisis Communications Diploma, the One Planet MBA at Exeter University, and is an Associate Lecturer at ual (University of the Arts London). 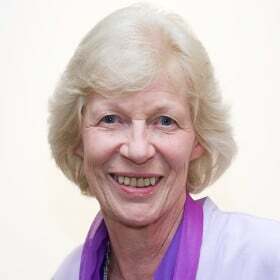 She has served as Trustee and Vice Chair of ecdp; is a trustee of the Essex Book Festival and currently chairs iprovision, the CIPR’s Benevolent Fund.